The search box above is live go ahead and enter a search. The Jackson Middle School Library Media Center has a variety of materials available for school assignments and pleasure reading (books, audio books, ebooks, and magazines). Students may have up to four items out at a time. Materials check out for three weeks and can be renewed. Holds can be placed on desired titles. Book title suggestions are always welcomed. Students can login to their Destiny library account with their computer login and password to see what is checked out and when items are due. Teachers can login to check textbooks in/out. Click HERE to go to Destiny login page. 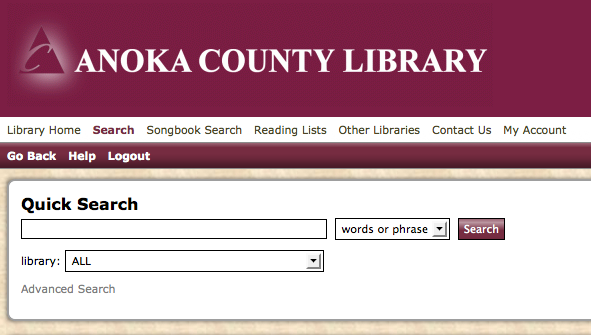 Anoka County Library offers many materials (books, ebooks, audio books, magazines, newspapers, music, video). An Anoka County Library Card is needed for reserving and checkout or a registered Hennepin County Library Card can also be used. Click the icon below to access the catalog. Hennepin County Library offers many materials (books, ebooks, audio books, music, magazines, newspapers, video). An Hennepin County Library Card is needed for reserving and checkout or a registered Anoka County Library Card can also be used. MNLink connects to libraries around the state of Minnesota. Users enter their Hennepin County or Anoka County Library barcode number to request/reserve. The item will be sent to your local public library for pickup and checkout. Also includes database access. Click on the icon below to access the catalog.